It was another negative week for US equity indexes, with net weekly declines ranging from -3.0% (Trans), -1.2% (Dow), to -0.4% (Nasdaq comp'). 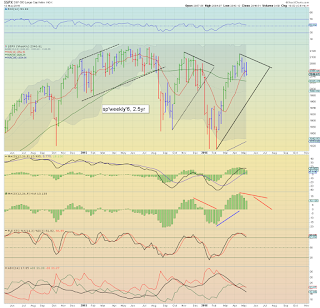 Near term outlook offers further downside of 2-3%. 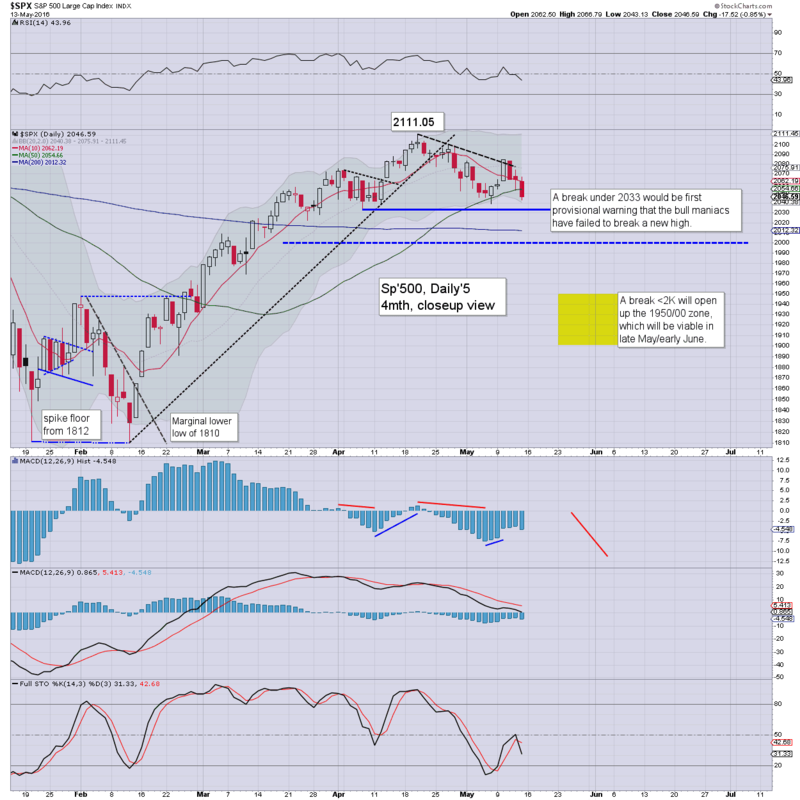 First opportunity for sustained and powerful downside looks viable from late May onward. 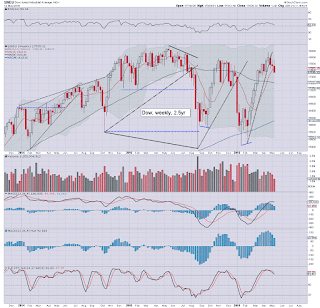 A net weekly decline of -10pts (0.5%), settling at 2046. 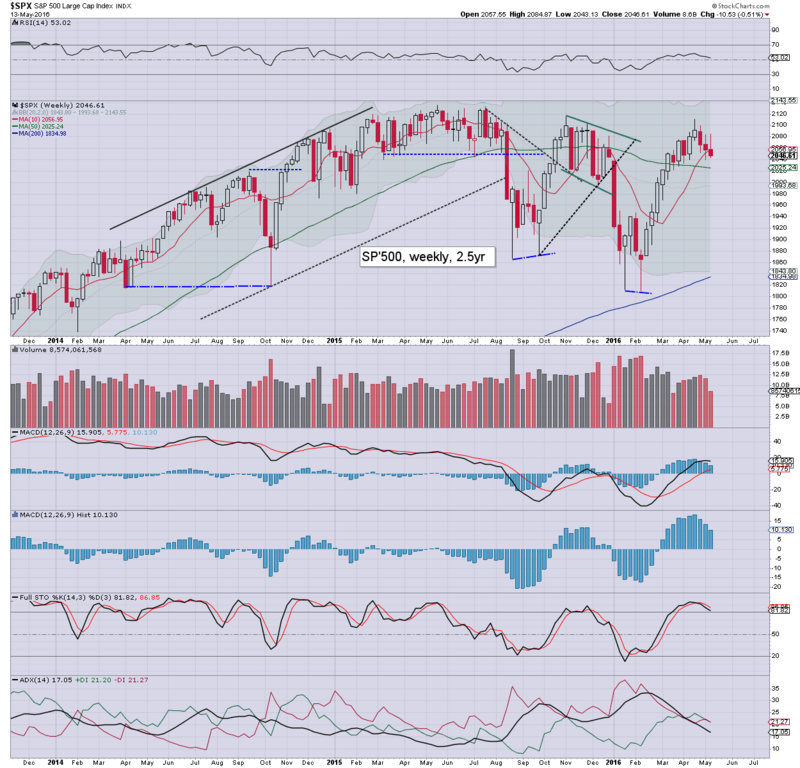 The weekly candle is a little spiky, and is suggestive that the equity bulls are exhausted, having ramped the market 301pts from 1810-2111. 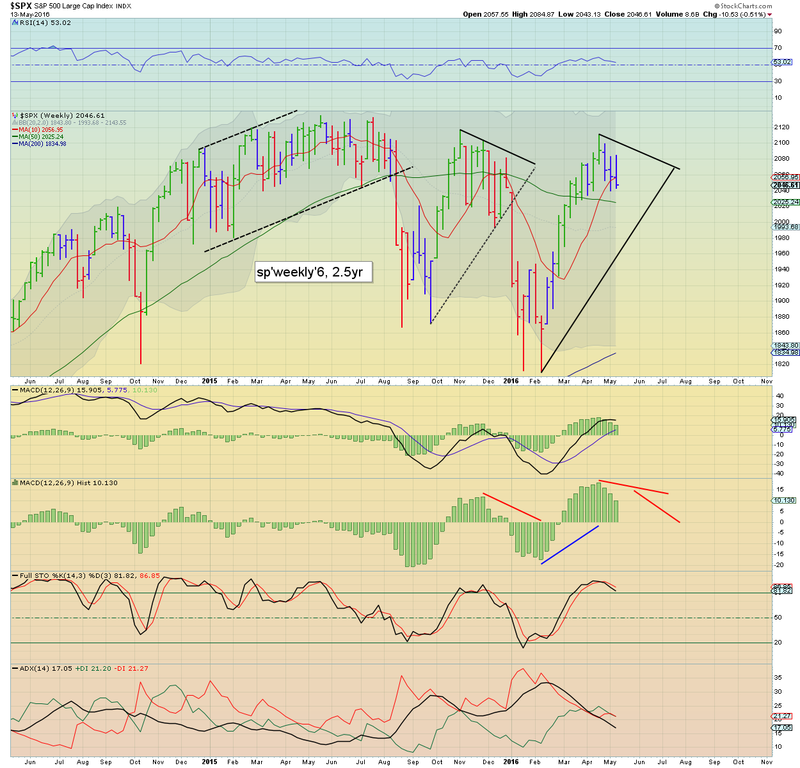 Underlying MACD (blue bar histogram) cycle ticked lower for a third week. At the current rate of decline, there will be a bearish cross in the last week of May. 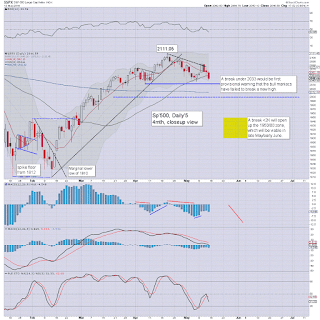 There are multiple aspects of support in the 2040/1990 zone. Things really only get interesting on a break into the 1980s. 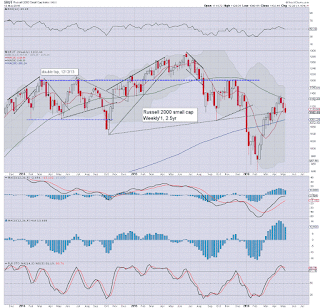 From there, its open air to the 1950/00 zone, which remains a valid target for the monthly close. 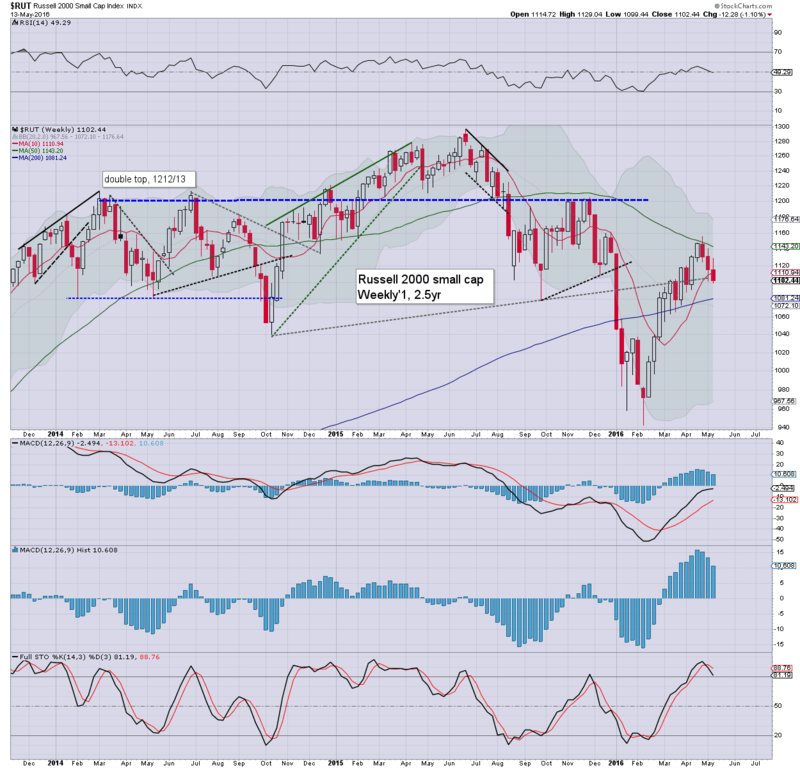 Best guess: sp'2111 is a key mid term high.. and regardless of any short term chop, an eventual powerful drop to the low 1900s.. with the 1800s in June. Price structure is suggestive of a giant H/S formation, and by default, that offers a grander downside target of the low 1600s this summer/early autumn. I am resigned to the central banks launching more QE, with the US Fed likely initiating NIRP - to match the ECB and BoJ. As a result, I still do not see a monthly close under the sp'1500s, and instead would expect renewed upside into year end. The tech' was the best performing sector this week (despite AAPL), settling lower for a fourth consecutive week, -0.4% @ 4717. Next support are the 4600/500s. An eventual break <4K looks very probable, with a likely capitulation low around 3200/3000. The mighty Dow swung from an intra high of 17934 (notably still unable to re-take the 18K threshold), to settle net lower by -205pts (1.2%) at 17535. Next support is around 17200. A break <17K looks viable end May/early June. 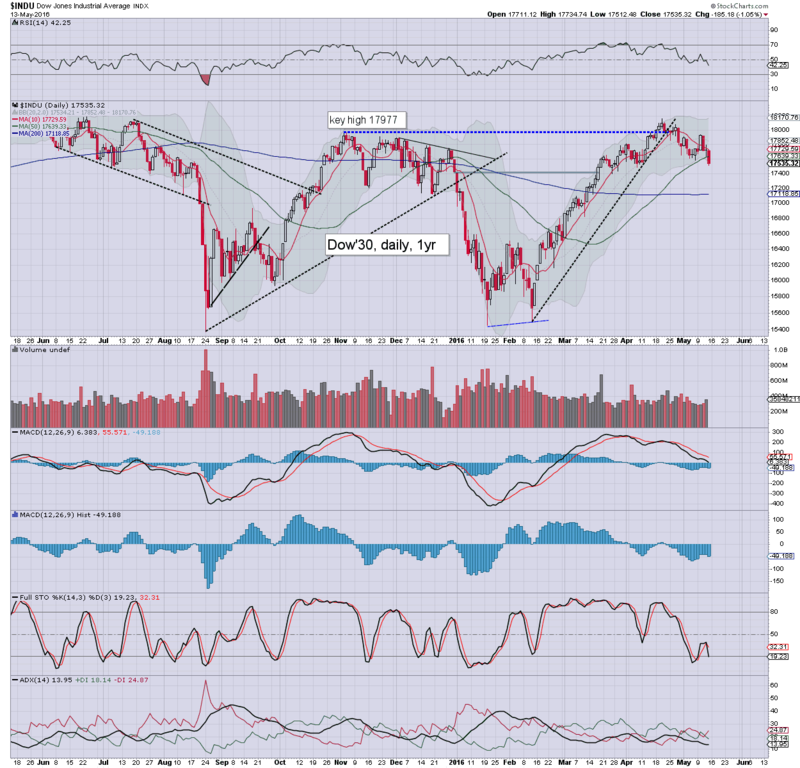 From there, first target is the Aug' 2015 low of 15370. The master index settled -0.8% @ 10228. A break <10K looks due, and eventually to 8K. 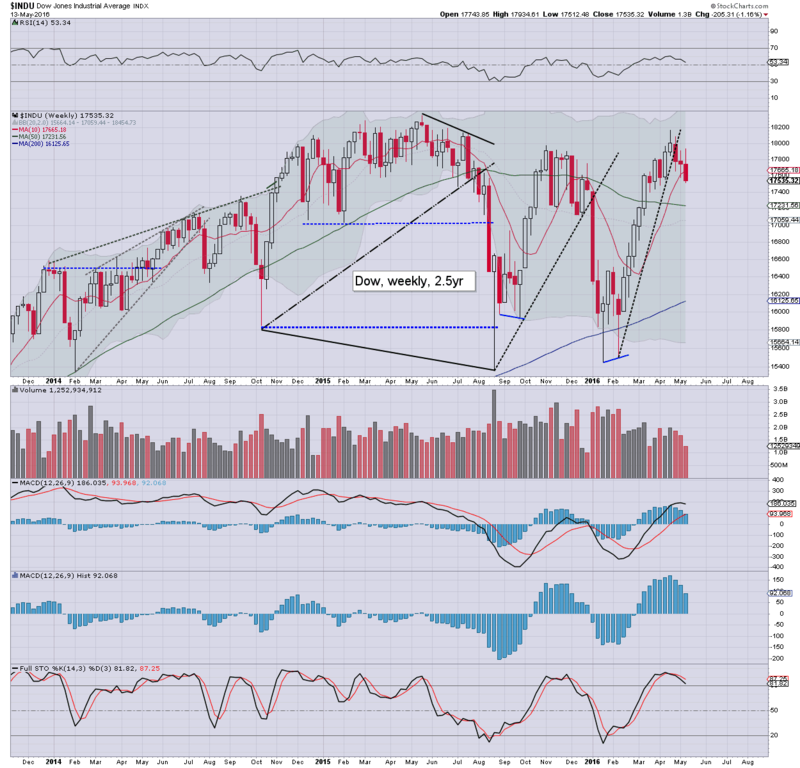 The second market leader - R2K, declined for a third week, -1.1%, settling @ 1102. The 1100 threshold (briefly broken on Friday afternoon), looks set to eventually turn to resistance on the next bounce... after first hitting the 1080/50 zone. 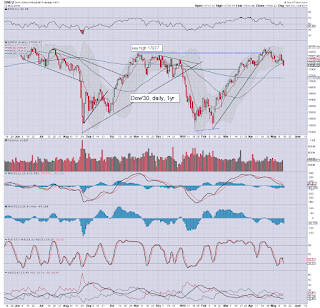 Broader downside to 875/850 seems probable this summer. 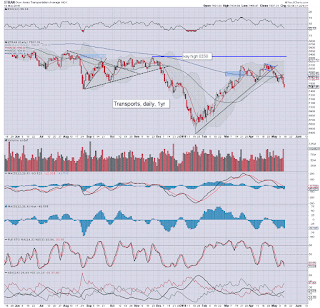 The 'old leader' - Transports, is leading the way lower, with a third consecutive significant net weekly decline, -3% @ 7507. Next support is around 7200s. Broadly, there is viable downside to the 6000/5500 zone. 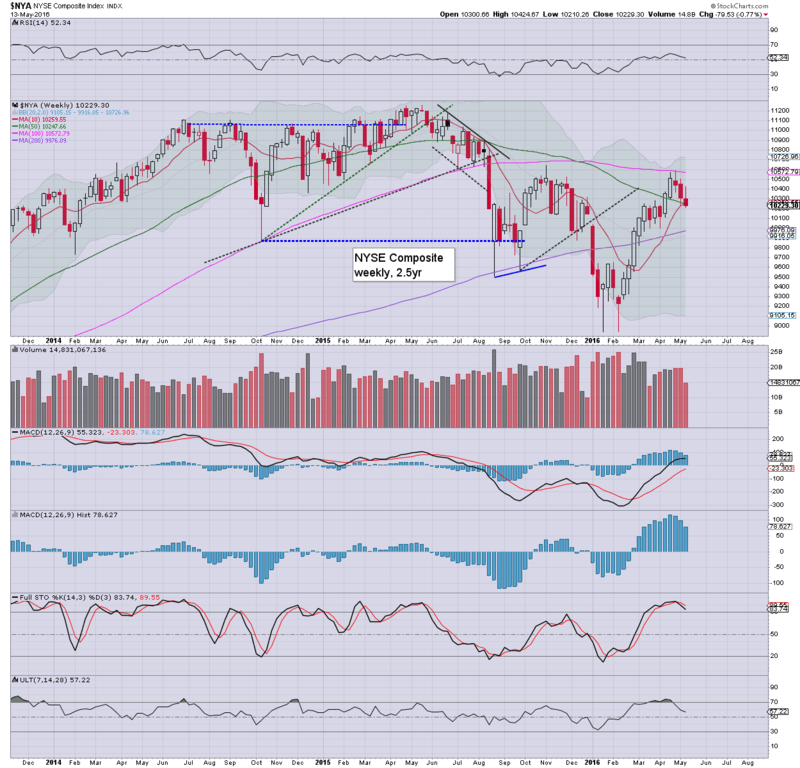 US equity indexes continue to cool from their April highs. 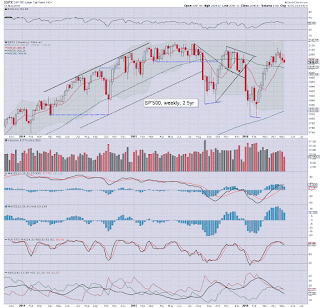 Clearly though, even after 3-4 weeks of downside, most indexes are still relatively close to recent highs. We're yet to see any real significant downside power, and the VIX is reflecting what remains a very complacent mainstream, still confident that 'everything is going to be just fine this summer'. 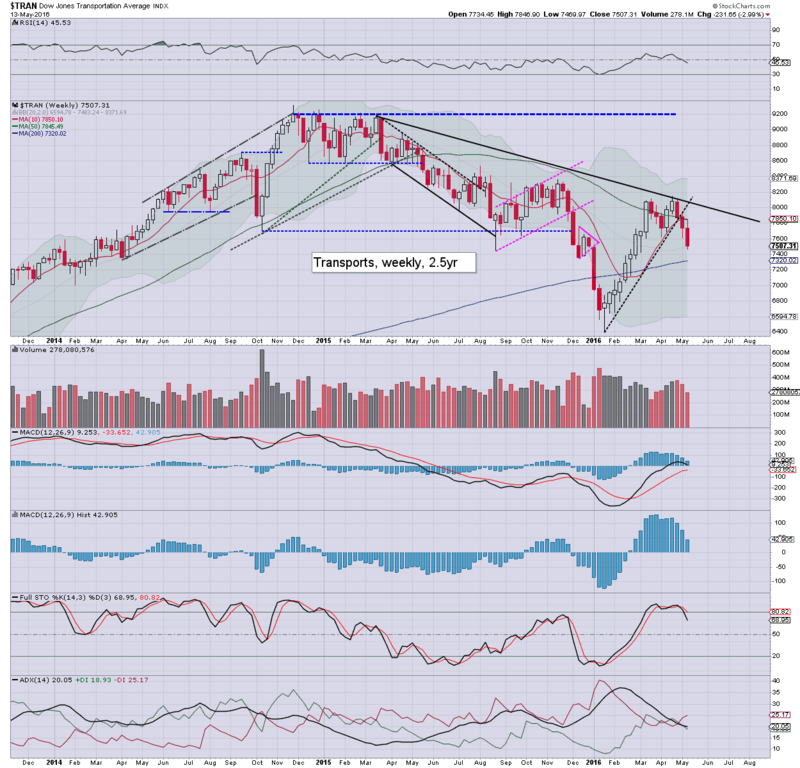 Most notable, the 'old leader' - Transports, which is naturally leading the way lower. 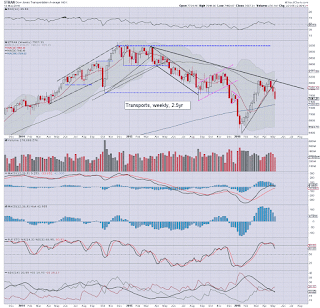 Unless the Transports can break a new multi-month high into the 8200s, the equity bulls should be increasingly concerned. Best guess: regardless of any near term weakness/chop.. a powerful wave to the downside looks due, with most US (and world) markets vulnerable to declining by around 20%. ... at which point the mainstream cheerleaders on clown finance TV will be screaming at the central bankers to once again save the world from the scary 'deflation monster'. *there are just a few fed officials due to speak, notably - Williams & Lockhart at a Politico event on Tuesday, and Dudley on Thursday. 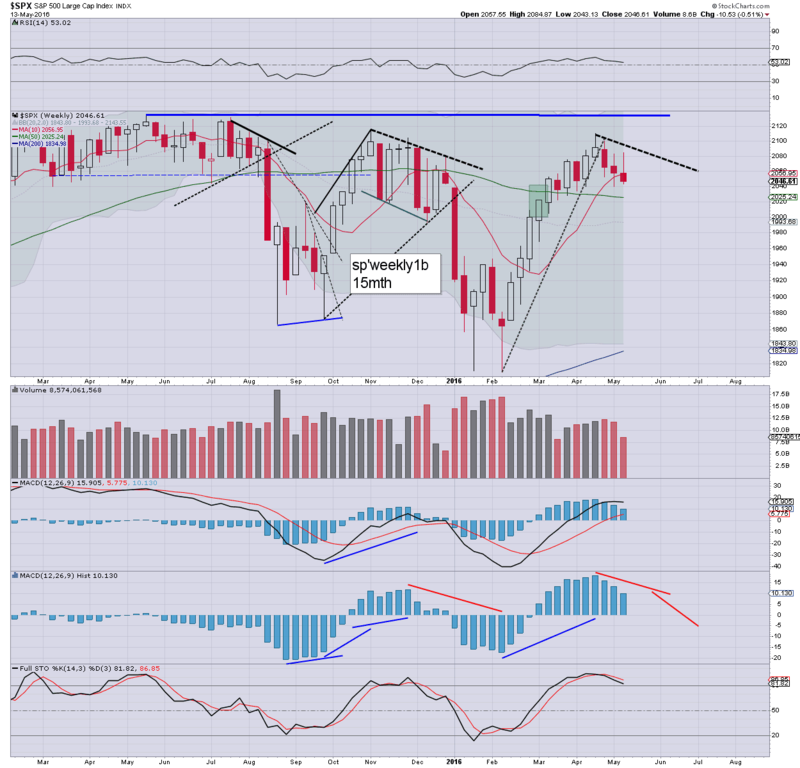 US equities ended the week on a pretty negative note, with the sp'500 seeing a third consecutive net weekly decline of -10pts (0.5%), settling @ 2046. 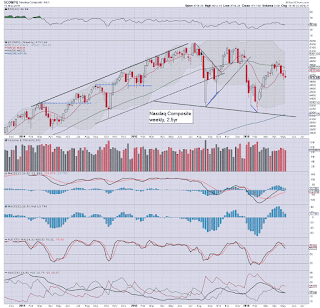 A major down wave looks due in late May/early June.. with broader market upset across the summer. *a notable third blue candle, settling under the 10MA. 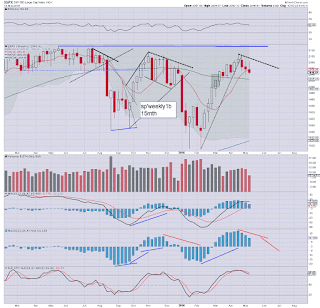 Suffice to add... a third consecutive net weekly decline, with this week's candle somewhat spiky... and is suggestive of upside exhaustion. 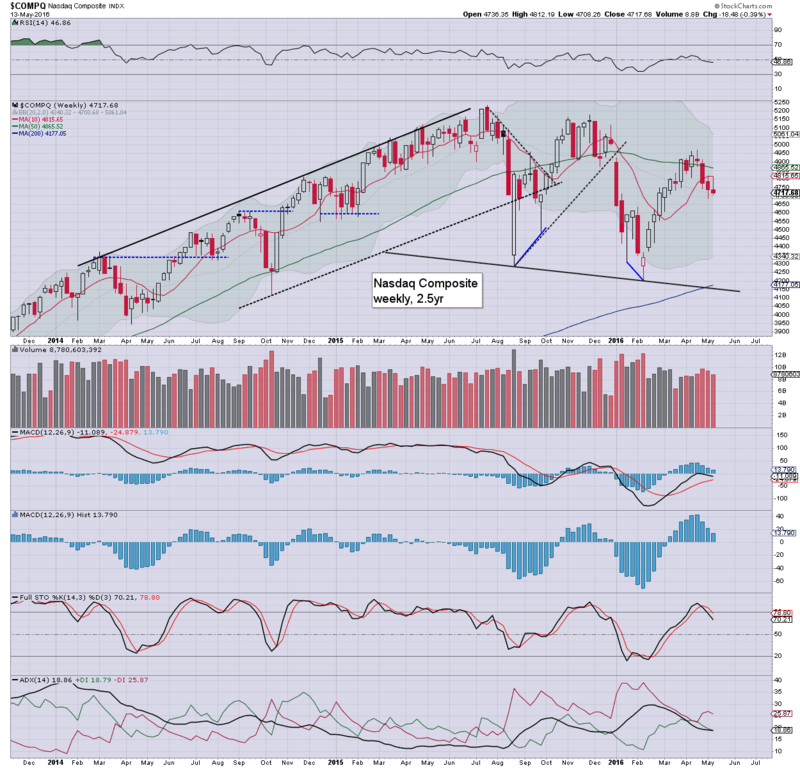 sp'500: the third consecutive net daily decline, but holding above last Friday's low of 2039. If the 2030s are lost, then 2000/1990s..'swiftly'. 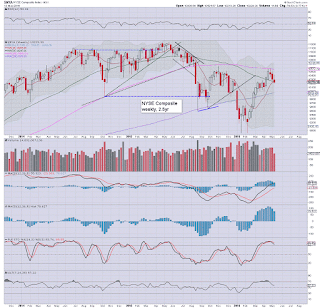 Dow: a decisive weekly close under the 50dma, next support is around 17200. Sub 17K looks out of range in the current down wave. 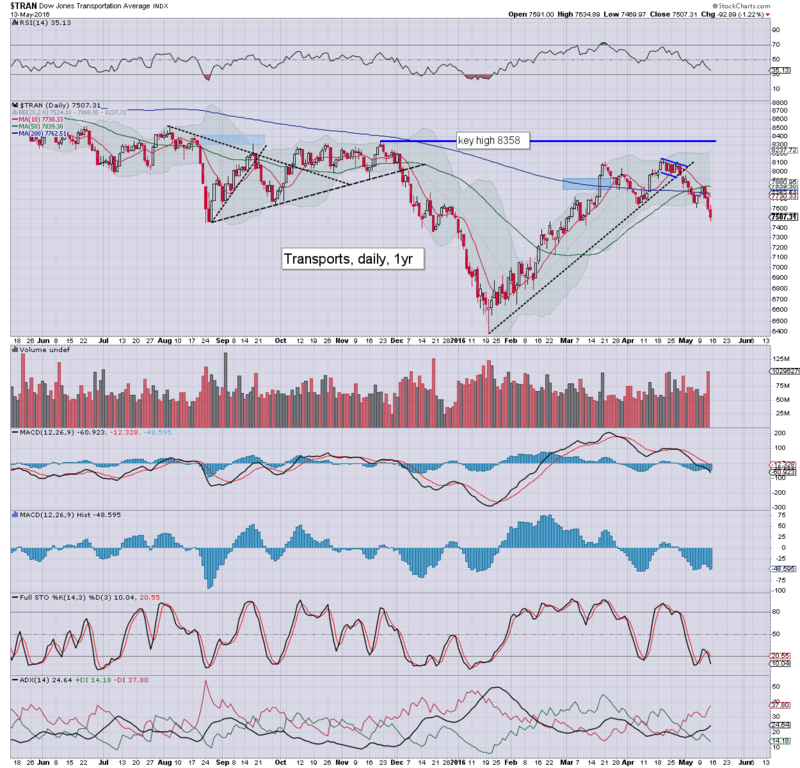 Trans: a third consecutive significant net daily decline, holding well below the key 50/200 day MAs. Next support is around 7200/100s.